---- high maneuverability provides for concentration of the bulk of the artillery on decisive directions quickly and discretely. ---- areas in the immediate vicinity of the line of contact with the enemy. ---- availability the Supreme High Command artillery elements to be attached to the front. ----nature of employment of various means of destruction. ---- about 2,000 antitank guided missile weapon systems. 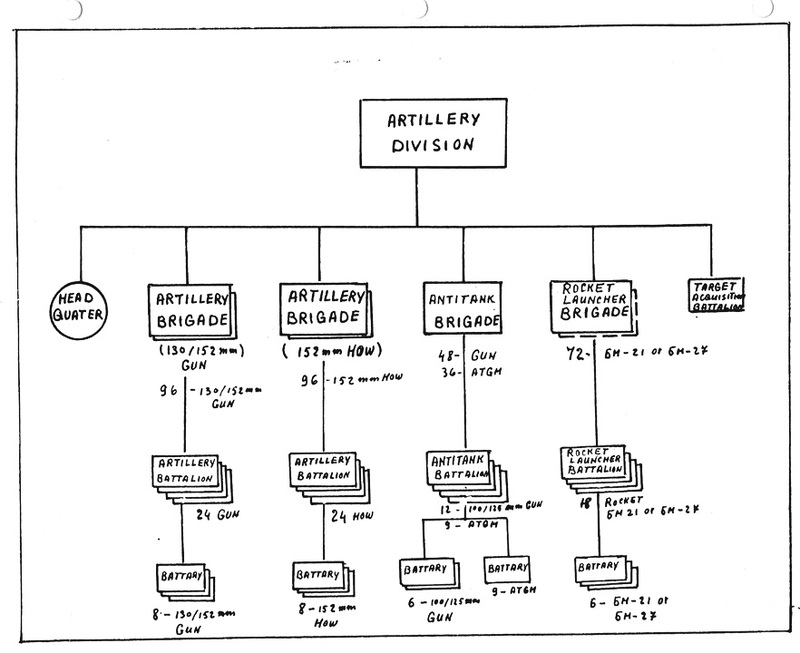 ---- High Command Artillery Divisions: A total of 246 guns and mortars are included in the divisions. Army's Artillery Brigade: Includes four artillery battalions with two battalions composed of 130 mm guns (thirty-six guns in two battalions) and two battalions of 152 mm howitzers (thirty-six howitzers in two battalions). The total number of artillery pieces in the brigade is seventy-two. Army's Antitank Artillery Regiment: Includes three battalions, each with two batteries of 100 mm guns (twelve guns) and one battery of antitank guided missiles (nine in a battery). The number of weapons in the regiment totals sixty-three as follows"
---- one battalion of 152 mm howitzers with eighteen howitzers a total of fifty-four in the regiment. ---- division's separate multiple rocket launcher artillery battalion which is composed of three batteries, each battery having six BM-21 multiple rocket launchers, with a total of eighteen in the battalion. 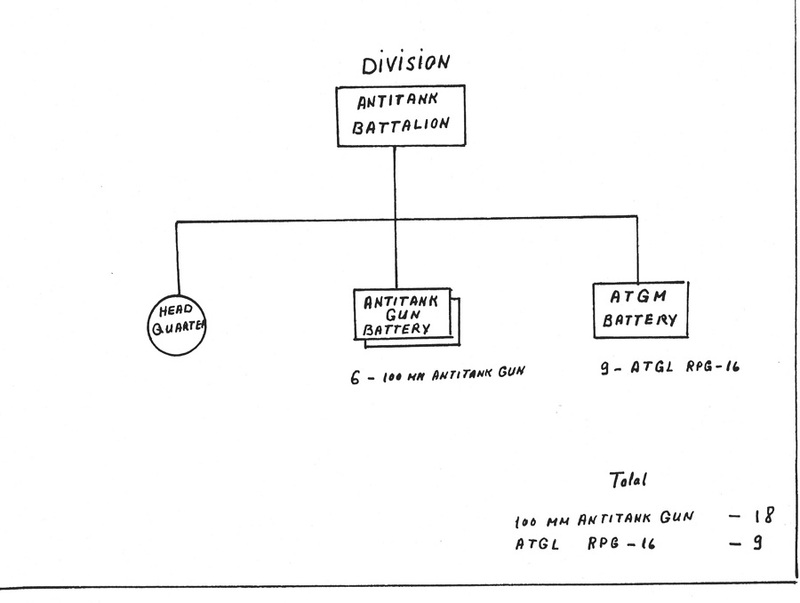 Division's Antitank Separate Battalion: Includes three batteries each composed of six 100 mm guns, a total of eighteen guns in the battalion. ---- one antitank guided missile battery of nine ATGMs. Motorized Rifle Battalion's Artillery: Includes one battery of six 120 mm mortars and one antitank platoon, consisting of four ATGM weapons and two RPG-9 grenade launchers. ---- cover gaps, open flanks, and boundaries across the front. ---- firm and continuous control of fire and maneuver. ---- antitank guided missiles with high maneuverability. ---- maintain high combat-readiness of troops for accomplishing assigned missions. ---- while conducting other important front missions. ---- determine the composition of front antitank reserves and specify their likely missions and the method of movement of front antitank reserves during offensive operations. ---- organize the front's supply formations with artillery equipment and ammunition. These targets are to be engaged simultaneously during artillery preparatory fire. The number of targets to be hit by the air force is deducted from the sum. To destroy the remaining targets the necessary number of artillery pieces are determined on the basis of the established norms for destroying (suppressing) typical targets. 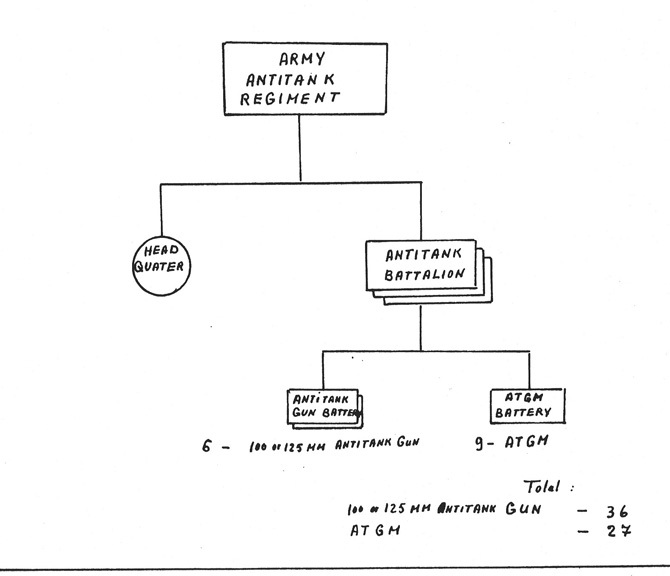 From the number of required artillery, as calculated above, the army's organic artillery is deducted, the balance represents the army's additional requirement for artillery (artillery reinforcement). 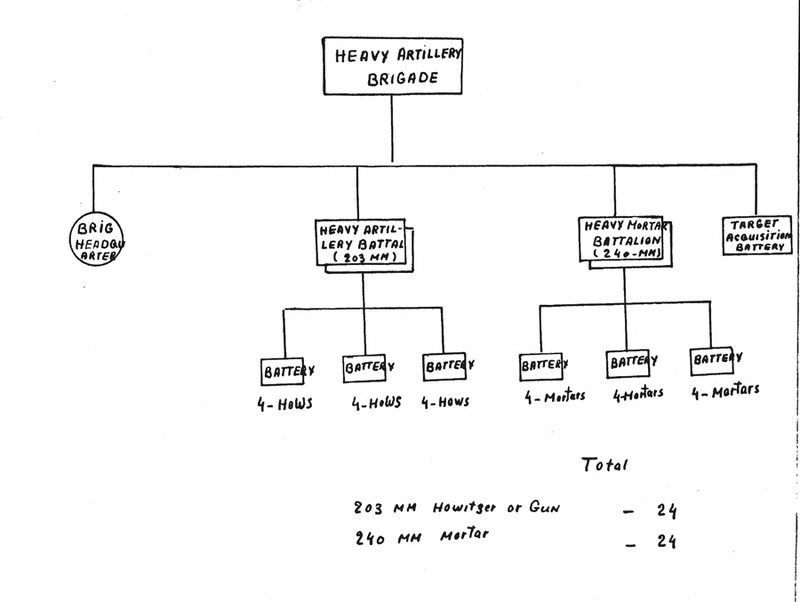 The sum of first-echelon armies' requirements for artillery constitutes the front's need for artillery. The second-echelon armies receive artillery reinforcement (attached artillery) when they are committed into combat. At this time they are given artillery reinforcements by diverting (resubordinating) Supreme High Command's artillery units and large units attached to first-echelon armies. Therefore, needs (requirements) of second-echelon armies for artillery do not count while assessing front requirements for artillery. ---- reducing the penetration areas. ---- Artillery is distributed and organized in groupings in accordance with concepts and conditions of front offensive operations. ---- At the front level only an antitank reserve is established. 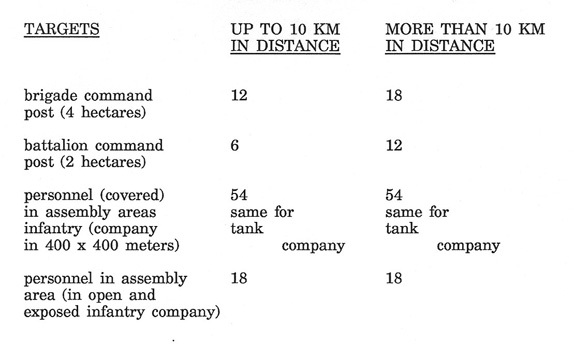 Front antitank reserves may include, in addition to one to two antitank brigades, tank and engineer subunits. ----During operations on tank threatened directions, the army must be given in addition to one artillery division, two to three antitank battalions. ---- disrupt enemy command and control. 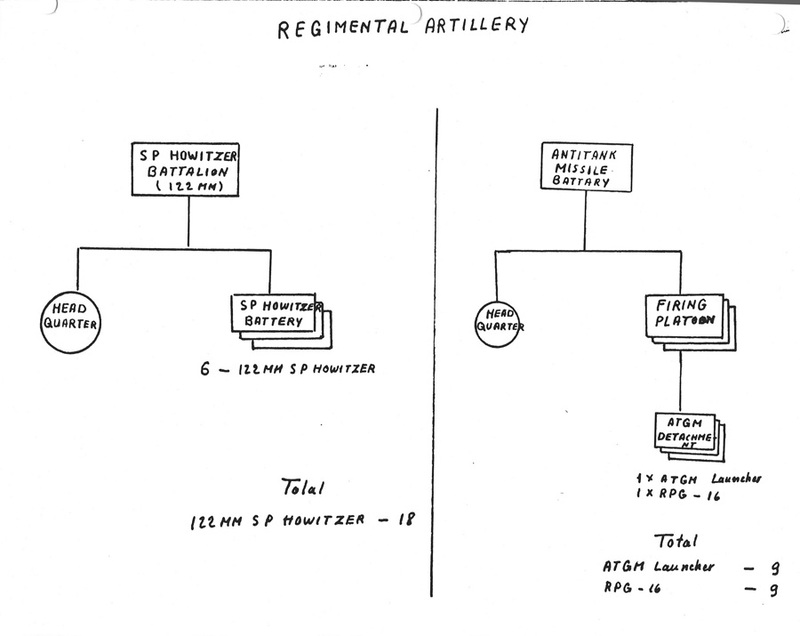 The greater capability of reactive (multiple rocket launcher) artillery, and its availability as an organic component of artillery divisions of the reserve of the Supreme High Command (which are attached to the front) provide for and necessitate establishment of the army reactive artillery group (AGRA) for centralized employment in the direction of main attacks and to conduct rapid maneuver of artillery to required directions in order to carry out missions inflicting loszes on main enemy groupings. ---- reactive (multiple rocket launchers). ---- reinforce fire of regiment's artillery groups. ---- other elements of combat formations. 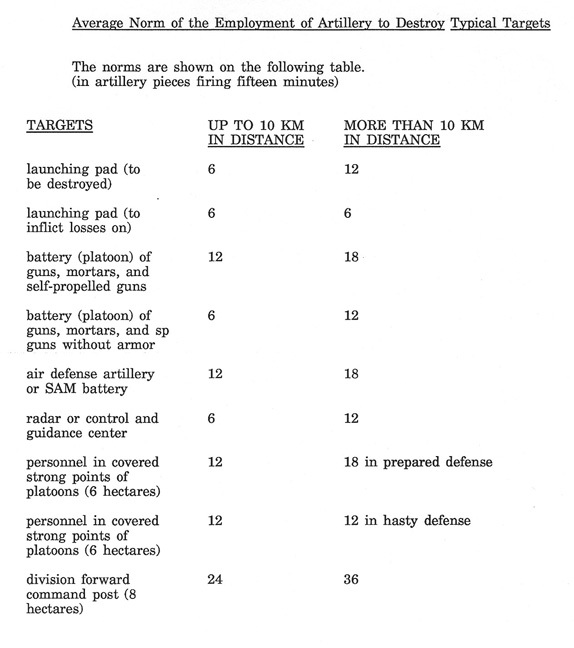 ---- composition of antitank reserves. ---- measures for protecting troops against mass-destruction weapons. ---- 1. Constant Combat-Readiness: Units and sub-units are kept at full combat strength as much as possible. Units conduct their daily training in accordance with the plan. They are capable of conducting assigned missions. Weapons and equipment are ready for combat employment. Weapons, ammunition, and other supplies are kept up to norms. ----2. Higher State of Combat-Readiness: Rocket and artillery units may be brought to the state of full combat-readiness in the shortest period of time. In this state of combat-readiness all units and sub-units are brought to full garrison accommodation, combat duty service is reinforced, and combat service is conducted in full combat-readiness. Officers and men are called to duty from leave. Material means and ammunition are loaded in vehicles. Units and sub-units are ready to move out from the garrisons. Operational groups with signal equipment are sent to command posts. ---- 3. Full Combat-Readiness: This is assumed in accordance with the plan and by the signal of combat alert. In this state of combat-readiness units and sub-units move out of their permanent garrisons to assembly areas or to position areas and occupy fire positions. Necessary combat preparations are made by units and subunits so they are ready to conduct combat missions. Simultaneously, units and subunits are brought up to full combat strength by using mobilization reserves. ---- destroy enemy troop control systems. 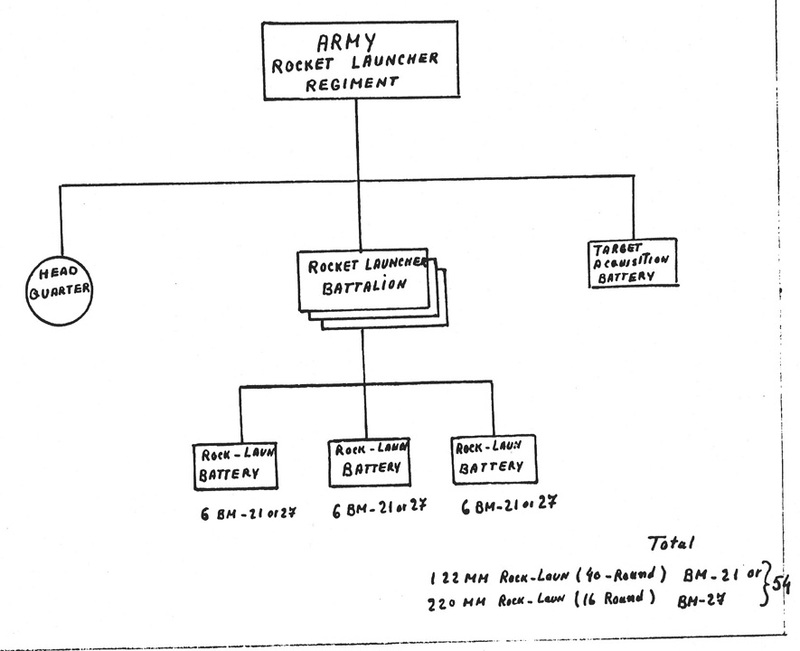 ---- reactive artillery (multiple rocket launchers) of the divisions adjacent to the penetration area. ---- a combination of these methods. ---- regimental artillery groups (RAG). ---- in areas weakly occupied by the enemy. ---- only part of it is committed into combat. ---- suppress enemy personnel, weapons, and tanks located in strong points. --------- by counterpreparatory fires, massive fires, and concentration of fire from temporary positions on the enemy forces in their attack (FUP) positions inflicting heavy losses on enemy main groupings. --------- massive fire and concentration fire (SO). --------- mostly by massive fire and concentration fire in support of counterblows. --------- concentration fire during the conduct of counterblows. ---- fight enemy artillery during combat actions to achieve fire superiority over the enemy on specific directions. ---- regiment artillery groups (RAG): Established in regiments operating on directions of enemy main attacks or defending on main defensive directions. ---- division artillery groups (DAG): Established in all divisions to assist regiments defending on directions of enemy main attacks and to inflict losses on enemy artillery and mortars. ---- army artillery groups (AAG): Established when sufficient artillery is available in the front and when enemy attacks are likely to be launched on specific directions and enemy attacks are expected to be conducted in narrower frontage. ---- continue interaction with rocket troops, air force, motorized rifle, and tank forces in foiling enemy attacks. ---- prepare troops for action and maintain high combatreadiness of troops for accomplishing the assigned missions. ---- gain time to complete defenses and to delay enemy attacks. ---- inflict losses on enemy groupings of forces particularly tanks. ---- while in direct contact with the enemy; In this case main fire strikes are launched against enemy artillery and tank troops. ---- while the enemy is located in depth and moving to attack defenses from the line of march, i.e., when the enemy is initially out of range of the artillery of the defending forces; In this case the artillery launches strikes against enemy command posts and his artillery while friendly aircraft and rocket troops deliver strikes on main groupings of enemy forces in depth. ---- prepare all artillery for struggle against tanks, prepare all types of fires, and deploy artillery to cover tank threatened directions so that it may engage the intruding tanks with direct (flat trajectory) fire. ---- in front of the forward defense line and in the depth, by fires of antitank guided missiles, antitank artillery, other artillery and tanks conducting direct fire and by antitank grenade launchers and other means coordinated with antitank obstacles. ---- an antitank brigade of the Supreme High Command's reserve may cover a fifteen to twenty kilometer front. ---- antitank brigade of the Supreme High Command reserve may constitute front antitank reserves. ---- cover opened and threatened flanks. ---- troops control and signal communications. ---- front aviation and rocket troops. ---- destroy enemy command and control systems. ---- concentration fire (SO) on call, just as in the case of the assault supporting fire during the attack. To achieve the aims of the offensive operation of the front, the decisive role is played by the actions of the strategic nuclear forces which destroy main enemy groupings and his vital targets and areas in the TVD. ---- inflict losses on main enemy armed forces groupings in the TVD. ---- areas of mobilization of forces, naval bases, ports, administrative, political, and industrial centers, state and military command centers. ---- vital targets of enemy logistic echelons, the destruction of which will destroy the firmness and viability of the enemy in operational depths. ---- inflict losses on enemy logistic targets and installations. ---- nuclear weapons are used in close interaction with other services of the armed forces, service branches, and weapons. Individual Strikes: Strikes on individual important targets. --- Front's Rocket Brigades: The number of such brigades in the front may be one to two. 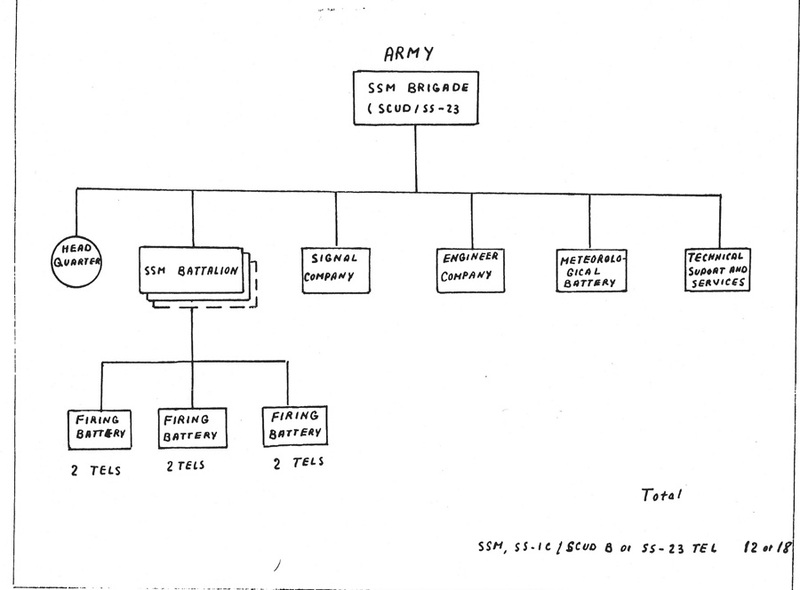 The brigade consists of the staff, three rocket battalions, control battery, transportation company, meteorological battery, combat engineer company, and several other separate subunits. 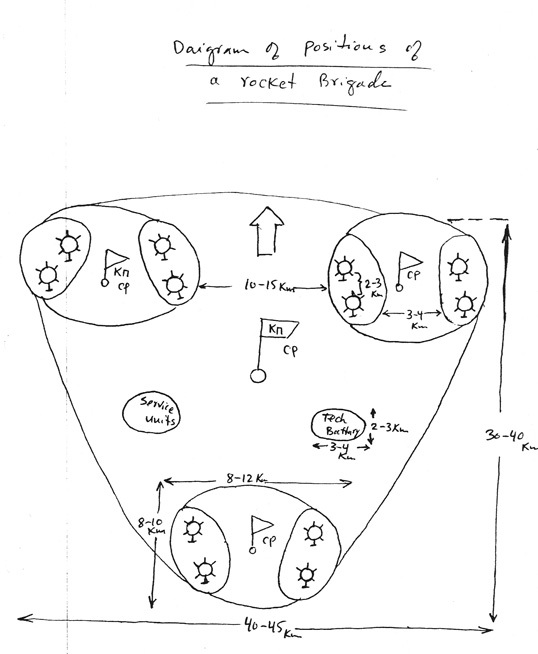 Each rocket battalion has four launching systems and therefore, there are twelve launching pads (systems) in the brigade. If front rocket troops are composed of two rocket brigades, then there will be twenty-four launching pads (launchers) of R-300 operational-tactical rockets in the front. For each launcher there are two nuclear rounds (rockets) and therefore, in front rocket troops there may be twenty-four to forty-eight nuclear rounds. ----- several other separate platoons. 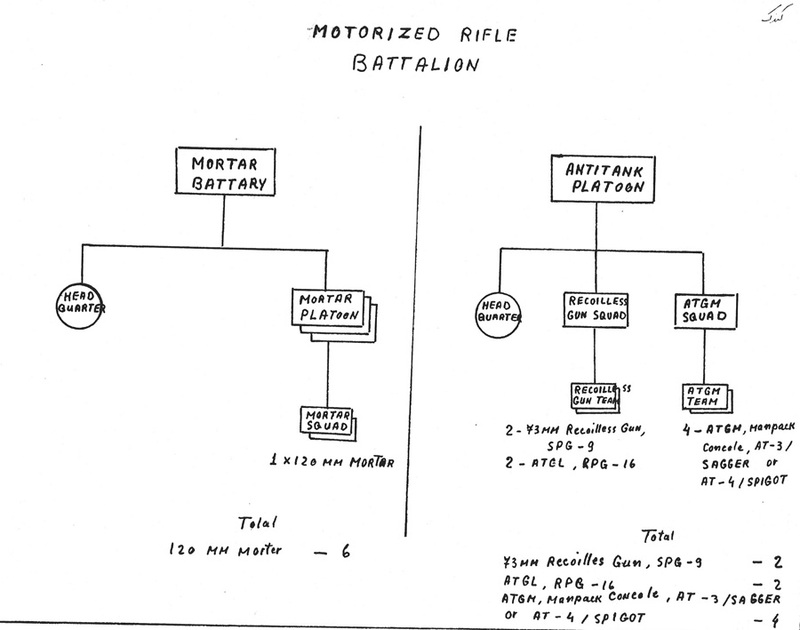 Division's Separate Rocket Battalion: There is one separate rocket battalion in each motorized rifle and tank division. 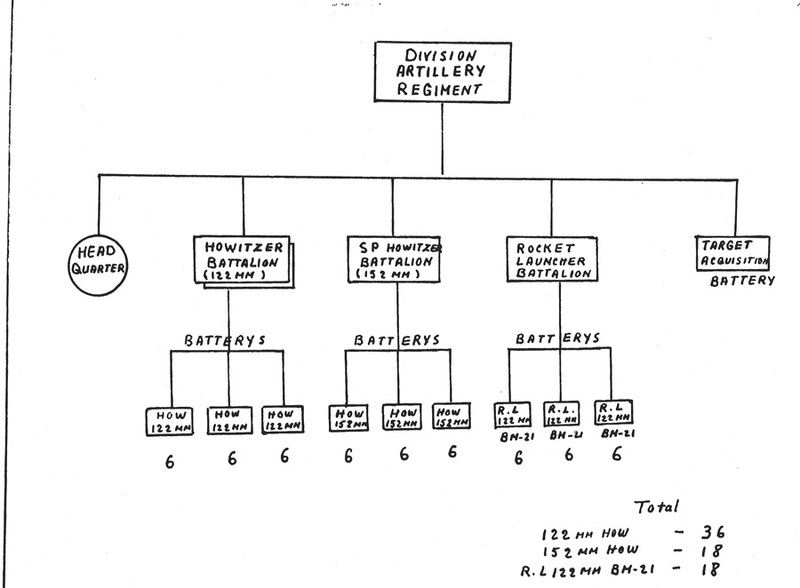 The division's separate rocket battalion is composed of two start batteries, control subunits, technical service platoon, and signal platoon. Each start battery includes two rocket launching pads. Therefore, there are a total of four launching pads (launchers) of R-65 rockets in the battalion. Each launching pad has three nuclear rounds with a total of twelve rounds in the battalion. When a front includes twenty-two to twenty-five motorized rifle and tank divisions there will be a total of eighty-eight to one-hundred launchers of tactical R-65 rockets with a total of 264-300 nuclear rounds of R-65 tactical rockets. ---- During the initial nuclear strike the front rocket troops may destroy six to nine enemy divisions, as well as, the nuclear ammunition depots, command posts of corps, armies and army groups, significant warning, guidance, air and air defense control centers. They may also partially damage tactical aircraft on the airfields and may suppress the bulk of air defense rockets. ---- They may destroy a Sergeant guided missile battalion and up to two to three enemy divisions, including their tactical nuclear delivery means. Or they may inflict 40% losses on 4-5 enemy divisions. There are twenty-four to thirty-four operational-tactical (R-300) and tactical (R-65) rocket launching systems. The army may participate in front initial nuclear strikes with twenty-five launching systems. To destroy one division ten to twelve rockets are required. Six to eight rockets are needed to suppress one division. ------ Rocket brigade may destroy targets located up to a distance of 240-270 km from the frontline while the brigade deploys in positions 30-60 km behind the frontline. ------Divisional rocket battalions may destroy targets located up to a distance of fifty-five kilometers from the frontline. The battalions deploy in positions ten kilometers behind the frontline. ----- Rocket brigades may destroy targets located up to 220-240 km from the frontline. The brigade deploys in positions sixty to eighty kilometers behind the frontline. ----- Divisional rocket battalions may destroy targets located up to forty-five to fifty kilometers from the frontline. Battalions deploy in positions fifteen to twenty kilometers behind the frontline. ---- maintain high combat-readiness of rocket troops for accomplishing assigned missions. ---- altitude of air bursts and security distance of friendly troops from the center of nuclear bursts. As a rule the initial nuclear strike of the front is planned in advance prior to the initiation of the operation. The missions are readjusted and confirmed in accordance with the actual combat situation during the conduct of the operation and assigned to subordinates. During direct preparation for fire the graphic of the initial nuclear strike is updated and necessary changes are incorporated in the graphics. The specifics on the preparation of front initial nuclear strikes during the conduct of the operation are as follows. Reconnaissance becomes very important, and information about targets to be destroyed is continuously acquired and reconfirmed. Accordingly, planning of nuclear strikes is adjusted. More responsibility is delegated to the army and division commanders with targets selected by them. All rocket troops and means of control are maintained at the highest level of combat-readiness. Missions are conveyed quickly to the troops. Continuous control of the fulfillment of missions is conducted. ---- then strikes of friendly tank and motorized rifle troops are launched against the flanks and rear of main enemy groupings which are conducting the counterblow, the grouping is encircled and destroyed while the main forces continue advancing into the depth of enemy defenses. ---- to destroy the enemy's troop control system. ---- rear service, material, and medical support. ---- 1. Constant Combat-Readiness of Rocket Troops: Personnel conduct their routine training in accordance with designated plans and are capable of conducting assigned missions. Equipment is ready for combat employment. Armament, ammunition, and material means are supplied up to the norms. ----2. Higher Combat-Readiness: This is a state of combat-readiness from which the units and subunits may be brought to full combat-readiness in the shortest time. In this state of combat-readiness all units and subunits are brought back to the garrison from exercise areas and other off-post duties. They are put on a full on-post accommodation. Combat duty detail is reinforced and combat service is conducted in full combat-readiness. Officers and men are called back from leave status. Ammunition, material means, and other supplies and equipment are loaded on vehicles. Units and subunits are ready to move out from the garrison. 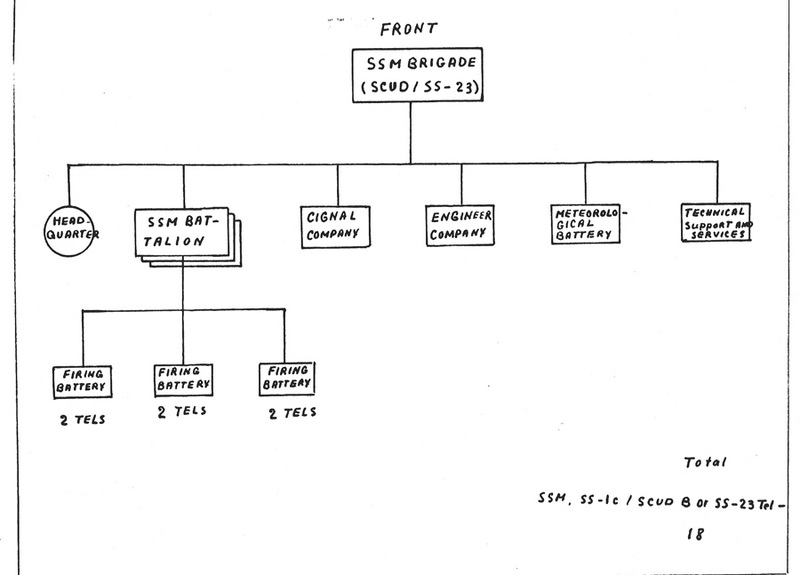 Operational groups with signal communication means are detached to command posts. Two to three hours are required to bring the rocket troops to the state of higher readiness. ---- 3. Full Combat-Readiness: This is assumed in accordance with the plan or on combat alert signals. Under this state of combat-readiness the units and subunits move out of their garrisons to assembly areas and position areas. They then occupy fire positions. Units and subunits conduct technical readiness, launching pads (systems) are loaded, and units get prepared for the conduct of missions. Units and subunits in assembly areas are augmented up to full combat strength on the account. of the mobilization reserves. Full combat-readiness is a state in which rocket troops and artillery may rapidly initiate the conduct of combat missions, i.e., armies and front rocket brigades and rocket battalions of motorized rifle and tank divisions deploy in their position areas and they are ready to initiate actions planned in the front's initial nuclear strike. In full combat-readiness start batteries are in main or start positions in the state of readiness number 3, 2, 2A, or 1. Rocket troops occupy main position areas or they deploy in assembly areas designated to be occupied after receiving the combat alert signal. There, rocket troops conduct technical preparations for fire. Four sites of assembling and charging (fueling) of rockets are established in a rocket brigade (one at the technical base of rockets and one each in technical platoons of rocket battalions, which totals four). At this point charging (fueling), loading, and mounting of warheads begins. fueling-charging (zapravka) -- 60 min. loadking (peregruzka) 15 min. 40 min. --- Readiness Number 3: The start battery is deployed in the start position. Launchers are loaded and the battery may fire after twenty-five minutes. 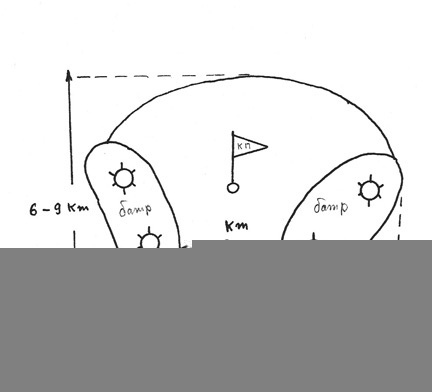 --- Readiness Number 2: The start battery is directed (aimed) at the main (osnovnoi) direction, the rocket is in a horizontal position. Fire may be launched after nineteen minutes. --- Readiness Number 2A: The rocket is aimed at the target. The securing mechanism is released from the rocket. Fire may be launched after thirteen minutes. --- Readiness Number 1: The rocket is aimed at the target and is brought into a vertical position. Three to four minutes are required to launch the rocket. ------ total time of technical preparation (five hours). ---- total time of technical preparation in divisional separate rocket battalion (eighty minutes). ---- for brigade (2.5 hours). --- b. in terms of enemy organization and armament in one kilometer of front which, depending on the operational density and enemy's nationality, may require 90-120 guns per km of front. 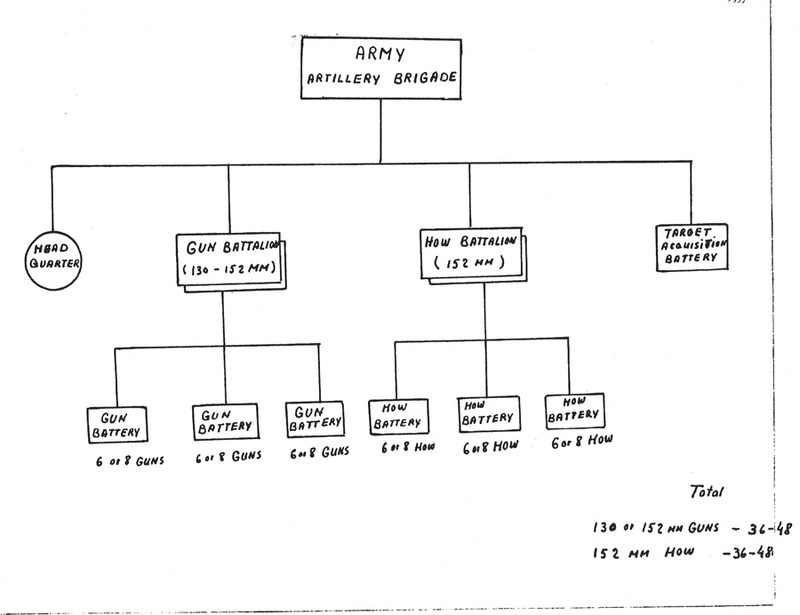 ------- army artillery group (AAG) eight to ten artillery battalions including four to five longer range artillery. ----- maintain high combat-readiness of troops for accomplishing assigned missions. ----- make decisions on employment of rocket troops and artillery on the basis of which the plan for combat employment is prepared. ----- other elements of army combat formations. ----- composition of antitank reserves of the army, divisions, and regiments. ----- measures for protecting troops against enemy mass-destruction weapons. ----- at the beginning of the conduct of long-range missions of the army. ----- to reinforce first-echelon troops which have suffered heavy losses. ----- suppress enemy personnel, firing means, and tanks in strong points. ---- fires from antitank means (antitank guns, antitank guided missiles, and tanks). ----While Inflicting Losses on Approaching Enemy Forces, the Distant Defensive Fires: Massive fires and concentration fires are conducted with the help of fire adjustment aircraft and radio technical means. Massive fire of all of the artillery or the bulk of artillery on important enemy groupings. Concentration fire is the fire of a group of artillery batteries (battalions) on individual enemy targets. To effectively suppress mechanized infantry companies in assembly areas or during movements, one artillery battalion and for the tank company three artillery battalions are required. ----Inflicting Losses on the Enemy During Deployment: Preparation of massive fire (MO) on likely assembly areas or areas of enemy deployment. 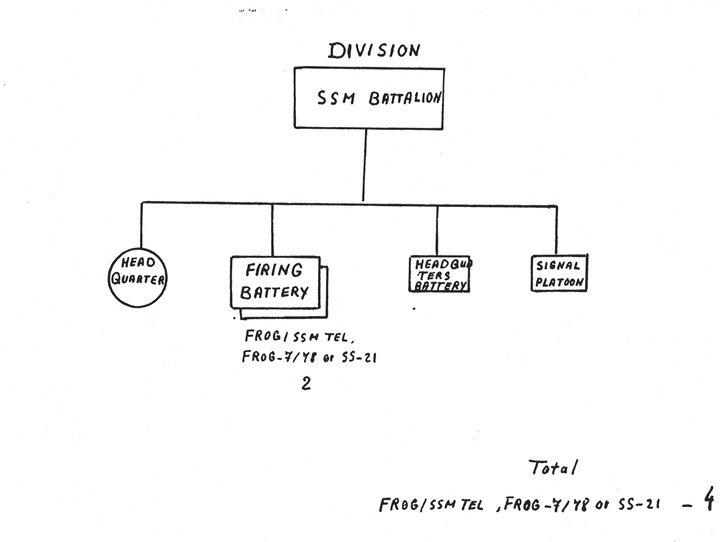 --- conduct of concentration for destroying and suppressing enemy artillery batteries and command posts. Fires During the Initiation of Enemy Attacks: Fires are conducted in forms of massive fires, concentration fires, and barrage fire to inflict enemy losses. Barrage fire is used at the beginning of an enemy assault. Each artillery battalion prepares barrage fires on two to three lines on different directions with a width of 900 meters. The final (closest) line is located 400-600 m from the forward line of defense. During Enemy Penetration in the Defense: In this phase barrage fires, massive fires, and concentration fires are used. Repulsing Attacks By Enemy Groupings of Tanks: Antitank reserves of the army, divisions, and regiments are used. Prior to Initiating the Counterattack of the Division's Second-Echelons and Prior to the Counterblows of the Army's Second-Echelon: Artillery supports the holding (retention) of specific defensive lines and conducts artillery preparatory fire or it conducts a fire strike for ten to fifteen minutes. -------- to initiate a decisive attack by the troops. ---- To support the counterblow, rocket troops and artillery are called (assigned). Artillery primarily conducts the struggle with enemy artillery and inflicts losses on enemy first-echelon troops which are in direct contact with friendly forces. The counterblow is conducted in the form of meeting engagements or in the form of passing through unorganized and hasty enemy defenses. While passing through the enemy's hasty defense, the density of artillery will be fifty to sixty guns and mortars per kilometer of front. ---- Artillery units participating in the counterblows, after moving to their positions, require 1-1.5 hours. The army artillery needs two hours for preparation, including one hour of daylight. If the distance is sixty kilometers then, considering movement along such a distance, four hours are required for preparing the preparatory fire. ---- Planning actions for artillery while initiating the counterblow is conducted during the planning of the operation and continues during the operation. The decision on employment of artillery is reconfirmed during the course of the operation in accordance with decisions on the conduct of the counterblows. ------- measures on troop control, etc. ------ enemy second-echelon troops and command posts. --- chiefs of artillery of divisions. --- methods of coordination (interaction) with other units.